When you become a newlywed, you invariably discover things that make you feel "Wow, why didn't I know about this when I was planning my wedding?" This review for Eclectique Soul gives me that feeling. Everyone who knows me knows that I love handmade goods. In fact, I first heard about today's vendor on Etsy.com, which is known for one-of-a-kind items. But, when I received a lovely sample packet from Eclectique Soul Paper & Gifts last week, I really didn't know what to expect from the contents inside. What a surprise! Inside were some fantastic pieces of stationery- all of them printed with a glittery image of a groom holding his bride. 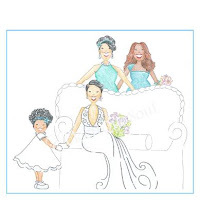 I loved the hand-drawn artwork that was embellished with glitter, as well as the swarovski crystals on the bride's earlobes! But I wasn't won over yet. What if all this gorgeousness was printed on flimsy paper? I really wanted to get my hands on each of the products individually. 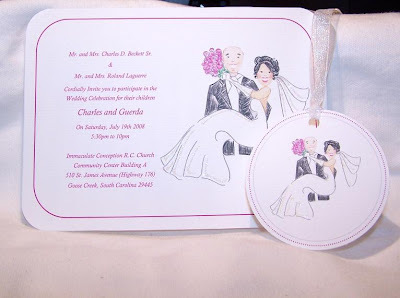 What I found was that each item- tag, label, invitation, and blank card- was printed on a nice, premium cardstock with a bright, clean font. It was as if I had created these cards myself. Well, if I had any artistic talent at all. Which I don't. Check out the Wedding Collection to see more invitations and save-the-dates. Eclectique Soul also does lovely products for children's events. You can bet I'm bookmarking the website for a later date. Who Has the Best Bridal Shoes on the 'Net? Bridal Nail Art - Yay Or Nay? Friday Fun Stuff: Will You Be My....?